Whether you are an employee or employer, your ability to navigate workplace change will determine your value or survival in the workplace. At the wise age of 25, David Bowie, songwriter and musician, wrote a timeless song about change. He sings wistfully, “turn and face the strange ch ch changes.” The lyrics acknowledge the artist’s yearning to adapt to fast changes in the world. And this sentiment is not just for artists. Each of us will benefit by looking into the eyeballs of persistent progress. Like facing fear, facing change is a decision. One that is fraught with indecision. Although I have embraced change frequently in my life, I recognize how the emotions of anxiety, fear, and pain make adapting to or accepting change difficult. I can still recall what it felt like to be stuck in a job where my vindictive boss actively worked against my progress. It took me time to make the leap forward, a decision where I voted with my feet by leaving the company, rather than put up with negativity and overwhelm. Your head may say flourish with the change, while the heart may cloud your better judgement. When faced with difficult times, it is sometimes easier to run in the opposite direction of taking action. For example, resistance holds me back in areas like learning a new technology platform. My latest challenge is how and when to integrate the latest technology for launching a podcast or webinar. 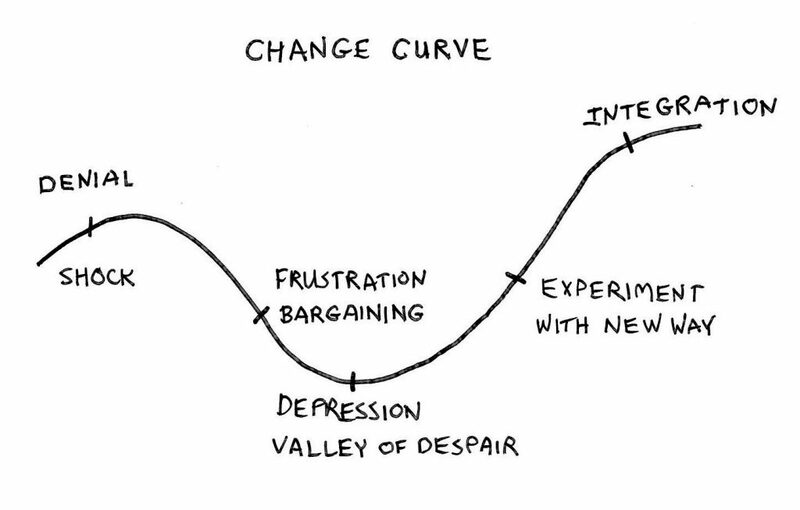 Experts have studied individual and organizational change, summarized by a familiar curve, discovering that humans process change in a predictable pattern. The common element in these models includes a drop in the curve, accompanied by feelings of despair, depression, and disillusionment. The following three change curves will give you the tools to succeed in multiple aspects of your life and workplace change. When I went through a divorce many years ago I became an accidental expert at change during the grieving process. Noted psychiatrist Elisabeth Kubler Ross created a helpful model to support individuals through grief and loss. The main stages of the process are denial, anger, bargaining, depression, and acceptance. This model gave me great hope during times of quiet desperation when I longed for life to get back to normal. The idea that I could get beyond my low points gave me hope, courage, and the energy to visualize a future. The depth of the downward curve cleared the way for an upward swing, rather than a demoralizing permanent crash. 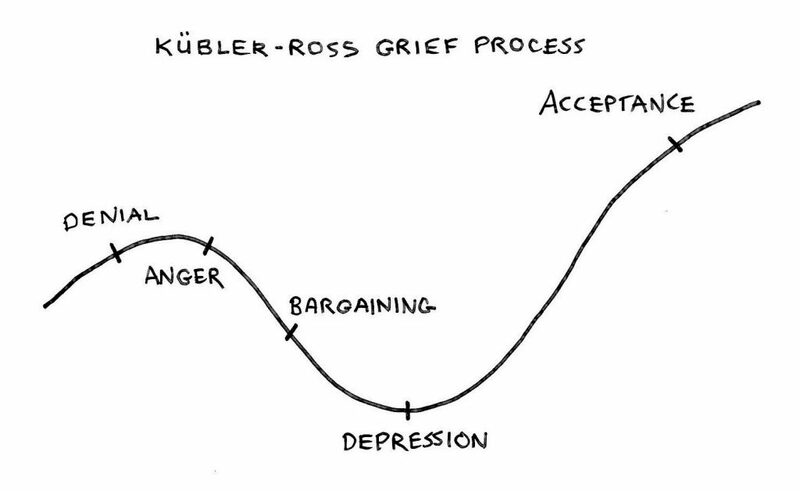 The Change Curve, influenced by Kübler Ross’s grieving process, includes the following stages: shock/denial, frustration, depression (in the valley of despair), experiment (with new way), acceptance, and integration. The slide into sadness or depression is a powerful and important part of the journey because it enables a sensible transition on the path to personal transformation. So let’s talk about the inevitable drop in change curve models. Why is descent into a valley of despair part of the progression through change? The answer is simple. From an employee or employer perspective, you simply don’t have the knowledge, training, and tools to move forward. You must make the effort to gather the resources and make a plan for migrating to the next stage. The valley of despair gives you level terrain to figure out your next steps through exploration and persistence efforts. You will also develop the personal muscle necessary to ascend the curve of workplace change. Seth Godin’s model for starting something new is complementary to the change curve. A special thanks to Heidi Thorne for pointing out the similarities in the shape of the curve. Starting something new requires pushing through hard times (just like grief and change). When mastering an unfamiliar skill or launching a new business, Seth suggests the path through tough times will result in a dip. This happens somewhere between starting and the top of the curve, where mastery is achieved. He refers to the downturn as the long slog. Without a slog, mastery does not exist. 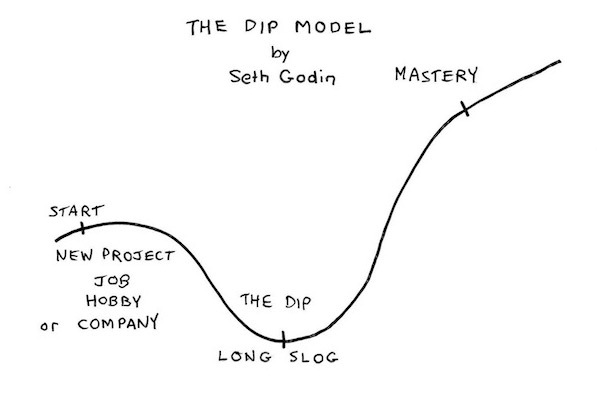 The Dip model focuses on mastery and success rather than pushing through workplace change. Yet, transformation is at the heart of scaling the upturn for all three models. The workplace can be a challenging environment in the best of circumstances. Knowing you have the tools to navigate change is the first step in taming the beast of uncertainty.